In this mysterious easy magic trick, you somehow cause several playing cards to adhere to your hand as if it were a magnet. Unlike most card magic tricks, this one offers a visual effect that doesn't rely on spectators selecting and memorizing a card. This one takes some preparation ahead of time, but the results are well worth it. See the trick in action and learn the secret. A gimmicked card that I teach you how to make. Using the scissors, cut a flap into one of the playing cards, as shown in the accompanying image. You'll need to make sure that the flap can easily fold up and down. Glue the card with the flap onto the back of another card of the same color. Make sure that you don’t glue the flap down onto the second card. The flap must remain free. After the glue dries, you'll have a card with a flap in its back. You'll be able to move the flap into an "up" position, or lay it down so it's relatively flat. With the secret flap up, you can pinch the flap between your middle and ring finger, and securely hold the card. This is the secret to the trick. Practice this for a bit - picking up and releasing the gimmicked playing card by pinching and letting go of the flap. With your hand held palm up, show the cards and get the gimmicked card into your hand with the flap up. Grab the flap of the card by pinching it between your middle and ring fingers. Insert the other cards underneath the gimmick but allow them to stick out around the sides. The other cards will be held between your hand and the gimmick. At this point, gravity is apparently holding the cards in your hand. Be sure that you keep all of the cards snugly against your hand so that they stay secure during the next step. You don't want cards falling out. Slowly turn your hand over and show that even though it's upside down, the cards somehow stay adhered to your hand. When you're done, turn over your hand and release the gimmicked card. If you can, secretly fold the flap down, which will allow you to display the cards both front and back. 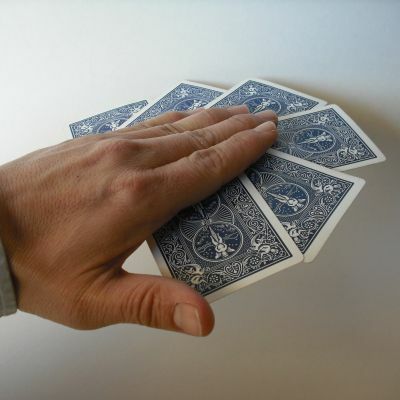 You can drop the cards onto a table and allow spectators to examine your hand. Spectators may not notice the flap that's sitting up on the gimmicked playing card, particularly when it's among lots of other playing cards. It's amazing how well the card blends in with the others. You can lower the flap gathering all of the cards (face down) and making sure that the gimmicked card is on the bottom. The weight of the other cards will push down the flap. It won't go down all the way, but enough so that it helps to hide itself. If you like, in the beginning, you can bring out the gimmicked card with the flap down. And as you're arranging the cards on your hand in the first step, use your hand to secretly open the flap and grab it. This will come with practice. Subscribe to our video channel to see the latest magic instructional videos.